Long version of the classic shotgun mic, with switchable high-pass and low-pass filter. Excellent off-axis (lateral and rear) attenuation. Free of coloration. The KMR 82 is a shotgun microphone with a high directivity that remains within the acceptance angle independent of the frequency. The advantage is that a sound source, for example an actor on stage, will not change its apparent tonal balance when moving within this area. Shotgun microphones are particularly useful in recording situations where a microphone cannot be positioned within the desired distance of the sound source to produce a sufficiently loud signal level. Typical applications are film and video recordings, where the microphone should not appear in the picture. The KMR 82 is very often used on stage. In principle, Neumann shotgun microphones use a combination of a pressure gradient transducer and an interference tube. If the wavelength of the frequency is longer than the tube length, the microphones work as pressure gradient transducers. At higher frequencies they operate as interference transducers for lateral sound. Off-axis sound sources are picked up with reduced level, but without coloration. Therefore, the microphones are well suited to record individual instruments of an orchestra. The pickup areas of several shotgun microphones may even overlap as, for example, during recordings on a large stage, without causing any problem. The KMR 82 is less sensitive to wind and pop noise when compared to the KM 150 miniature microphone with a similar high directivity. 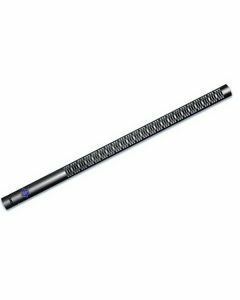 The shotgun microphone features extremely low self noise, good impulse response, and high output level. The KMR 82 is a shotgun microphone with a very directional characteristic. The microphone capsule is positioned inside a housing tube that is acoustically open but has a high flow resistance. The directional pattern of the microphone is lobe shaped. The attenuation of lateral sound is practically independent of the frequency. The KMR 82 has a frequency independent directivity within a pickup angle of 45° for audio signals that determine the tonal balance of the program material. Between 2 kHz and 15 kHz the KMR 82 has a boost to compensate for HF transmission losses in air when recording distant sound sources. This may overemphasize any sibilance if the microphone is used close-up. Therefore, a two-position slide switch allows to select the setting that is best for balanced upper frequencies. The KMR 82 has a high-pass filter to suppress subsonic interference. The cutoff frequency may be raised to 120 Hz ( - 3 dB) with a built-in two-position slide switch. The shotgun microphone features very high output capability and a remarkably low self-noise level. Its low power consumption, light weight, and low sensitivity to wind and handling noise, makes it an ideal tool for news gathering on location. Small dimensions, together with a balanced center of gravity, make handling easy without any whiplash effect. However, when on location and during strong wind conditions, we recommend using an additional wind screen (included as standard accessory). The wind screen is made of polyurethane foam and also serves as soft padding of the microphone in its leather carrying case. For mobile use a handle and an elastic suspension are available.